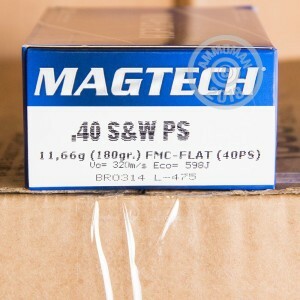 These .40 S&W rounds are a great, economical target load for your Glock 23, Springfield XD, Smith & Wesson M&P, Browning Hi Power, or other pistol. Manufactured near Sao Paulo, Brazil by a top defense contractor, these rounds use components all made by the same company in-house for maximum quality control and consistency. The 180 grain full metal jacket projectile produces typical .40 S&W ballistics. 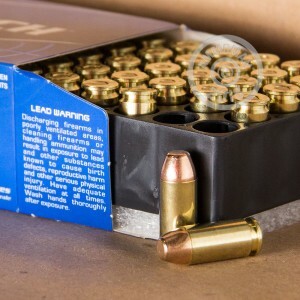 These rounds use non-corrosive Boxer primers and reloadable brass cases and deliver excellent performance at a moderate price. 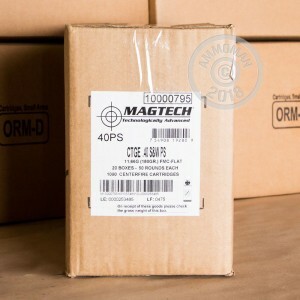 Buy a few boxes of this ammo or any other items to get your order total over $99 and qualify for FREE shipping. It's our way of thanking high volume shooters for choosing AmmoMan.com for their needs! Shot great and clean. Its better than your average plinking ammo.